Submitted by Mike Penn on 5 December 2018. Click the Media tab to see a YouTube video of our day! We were supposed to fly about 500-mile "grid west" of here to service two Automatic Weather Stations called Gill and Margaret. But, we were scrubbed for our Twin Otter flight due to bad weather at the destination. It looked like today was going to be filled with testing and preparing for going to the South Pole in a few days instead of an exciting flight. But, our fortunes changes and we were informed that we were moved up on the helicopter schedule! That means that we got to fly about "Grid West" about 50 nautical miles (knots) from here. (Knots are similar to miles but miles are measured on a flat surface and knots account for the curvature of the Earth, so knots are slightly longer than miles.) We went to AWS Laurie II that is at 77˚ 26'20" S/ 170˚ 45' 00" E. (When you read DMS coordinates, it is read as "77 degrees, 26 minutes and 20 seconds South, 170 degrees, 45 minutes and 0 seconds East.) And that means... A helicopter ride! 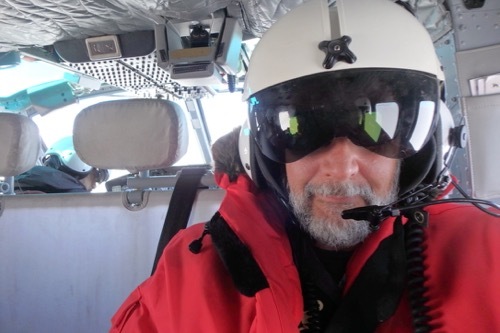 PolarTREC teacher Mike Penn in Bell 212 Helicopter flight helmet. This trip is on a "Bell 212" which is a civilian version of what we used to call a "Huey" in the Army. Bell 212 takes the AWS team to Laurie II AWS for servicing. There is another type of helicopter flown down here that we probably won't be using (because they can't carry as much) called AS-350-B2s Astars. It was about a 45-minute flight to our location. We flew past Mt. Erebus (an active volcano) on our way to the destination. Smoke can be seen being emitted from Mt. Erebus, an active volcano in Antarctica. For every flight, we carry one survival bag for every two people, so we had three, for the four of us on our team and one for the pilot and co-pilot. They left two of the survival bags with us. Survival bags are always left with field teams. It was a strange feeling watching the helicopter leave us out there all alone. When they left, we were dozens of miles from the nearest humans! We had work to do. The device in the yellow box is an extremely accurate GPS unit. 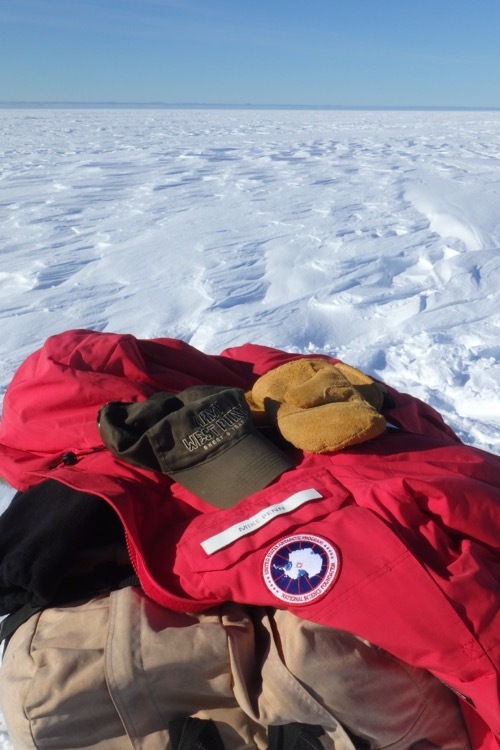 It is being used to pinpoint the location of AWS Laurie II in Antarctica. 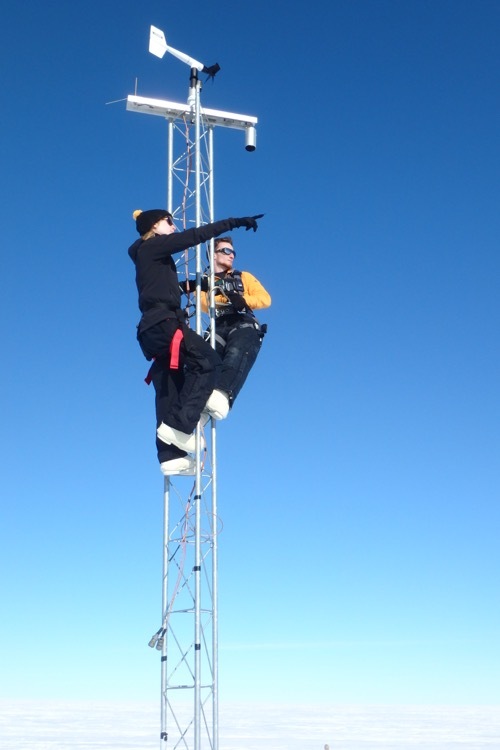 We "raised" the tower by adding a tower section to the top of the tower (it is about 4 feet deeper in the snow than it was when it was last serviced) and raising all of the equipment. 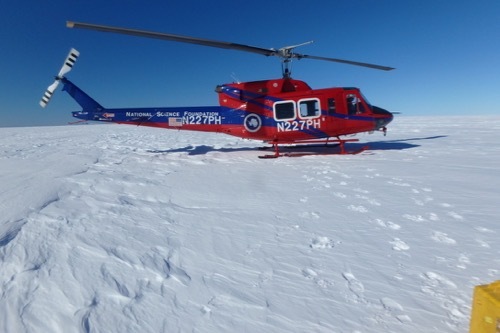 Lee Wellhouse servicing AWS Laurie II in Antarctica. We each took turns climbing the tower in order to attach all of the instruments and sensors. 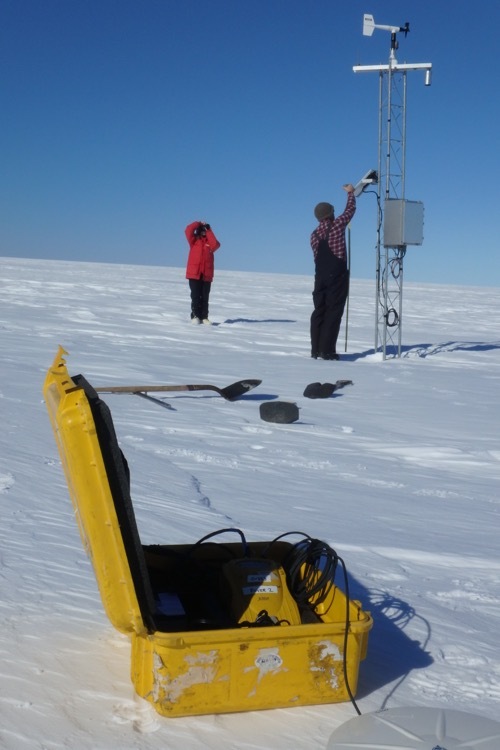 AWS team raises tower on Laurie II AWS in Antarctica. Several hours later we were finished! We called the helicopter and they were able to come and get us! That meant we get to sleep in a warm bed tonight! Why did the tower need to be raised? Was it at risk of getting buried, or does it need to be a certain ideal distance above the ground to operate effectively? Do the towers ever have to be lowered? Why did you need the super accurate GPS? Was there something aside from the tower that was hidden beneath the ice? And how fast can the weather change? If help is a 45-minute helicopter flight away, can a nasty storm crop up faster than help can be dispatched to your location? I assume that's not guaranteed, hence the survival bags. What's inside them? Sorry for the barrage of questions—no need to answer all of them if you're needed on the front lines to help fend off the penguins. Gary, these are all good questions. I'll be writing a journal that should answer all of these and a few others, so stay tuned! Thanks for following along a taking the time to ask all eight questions! Does hot chocolate taste better in Antarctica? When you were in the helicopter did you get anxiety being in there or was it pretty cool. Adrianna, I've been in a helicopter before, so it wasn't a big deal. I really enjoyed the flight! It is much different than flying in an airplane, the only thing that can be weird is that sometimes you have to sit facing the rear of the helicopter, and I prefer to set facing the front. Other than that, it was a beautiful flight! 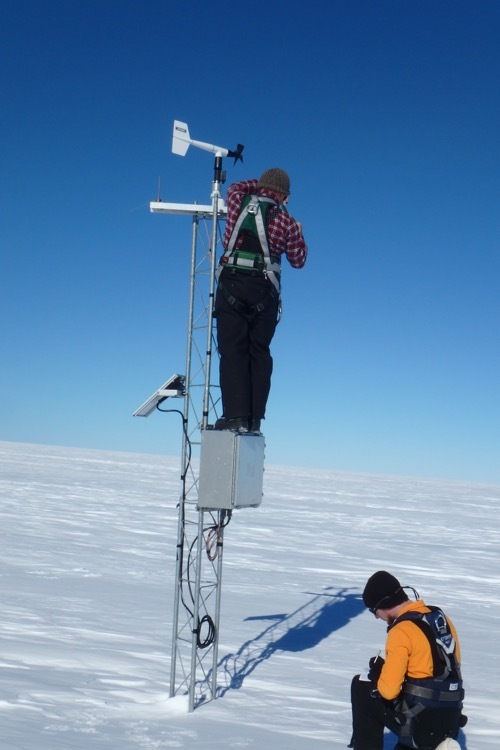 How can cameras work in Antarctica if phones do not? Burke, My phone will take pictures (if I keep it warm!) but it won't work as a telephone. There is no cell phone service here at all. Other than that, my phone will do everything else (that doesn't require a cell or internet connection). Thanks for reading my journals and taking the time to ask a question! How tall is the active volcano? Camden, Mt. Erebus (named after the Greek god of primeval darkness) is 12,448 feet high. By the way, it was named in 1841 during an expedition led by Sir James Clark Ross, who named it after one of his ships, the H.M.S. Erebus, which is a fitting name for the volcano, don't you think? 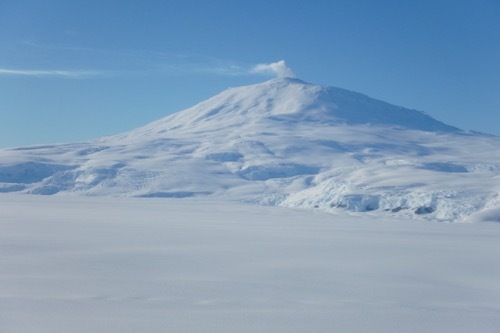 Mount Erebus is the most southerly active volcano on the planet! I really enjoy your posts. The pictures and descriptions of your work are great. Your feeling of being alone and far from civilization is similar to when I have been standing on top of a 14K peak alone and seeing no other human on the horizon. Kind of cool and kind of scary. MK, I really appreciate your comments! It isn't easy to get to a place like your 14K peak or my desolate iceshelf, but it is humbling to realize how small we are when you ARE in a spot like that. thanks for answer my ? Burke, I am so glad that you asked the questions! You and your questions are the reason that I am doing this. My job is to be a good communicator of the science I am doing and to be approachable to students like you. The fact that you feel comfortable enough to ask questions is a positive sign for me that I am effectively doing my job here. So, I thank you for asking the questions! Lynne, Yes, it WAS cold out at the site of the Sabrina AWS. It was at 84˚ South Latitude so it was pretty close to the South Pole. Generally, the further south and the further from the open ocean a place is, the colder it is. The temperature there was about -18 with a wind chill of about -40˚. It started out pretty nice (cold, but not much wind) but the longer we were there the colder and more windy it got!